Nice DC lamp for the brake light. Guess I'll be seeing this when I come to work soon. Maybe, not sure if he has been riding it lately. Definitely stands out when near the rest of the bikes. Yeah, I know the guy that built that one. I can say that it is an original design. You know the creator of this machine? I would pay money if he came here and told us about the build and/or some of the motivations/influences behind the unique custom touches the bike has. I told him today about the bike getting some attention here. He wont be able to log on until tomorrow, but he seemed interested in joining the forum. How to make a bike be able to go off road, put knobbies on it. "Good front forks from a silvering"
Because tourers are known for their great off road suspension. 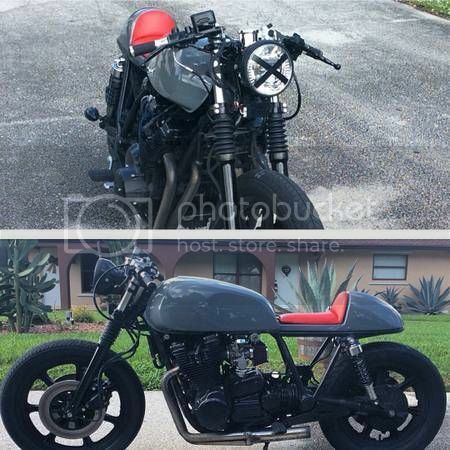 Nothing to see here but the usual delusional Cafe Racer "builder" with what he thinks is the most badassed, head turning custom. I suspect this is so beyond... anything... that nobody will give him a hard time. That's one good lookin bike..
Hey that's my bike! Yup I'm the proud owner, designer, and fabricator. Jackaldj1 and fiveohford like this. Awesome! Where to start? Hmmmm. How about better pics of the shovel handle please. How did you decide to use that as a headlight bracket? What was the inspiration? liberpolly and tunus like this. This is a first to me. Honda built in Italy with many ducati parts as claimed by this seller. 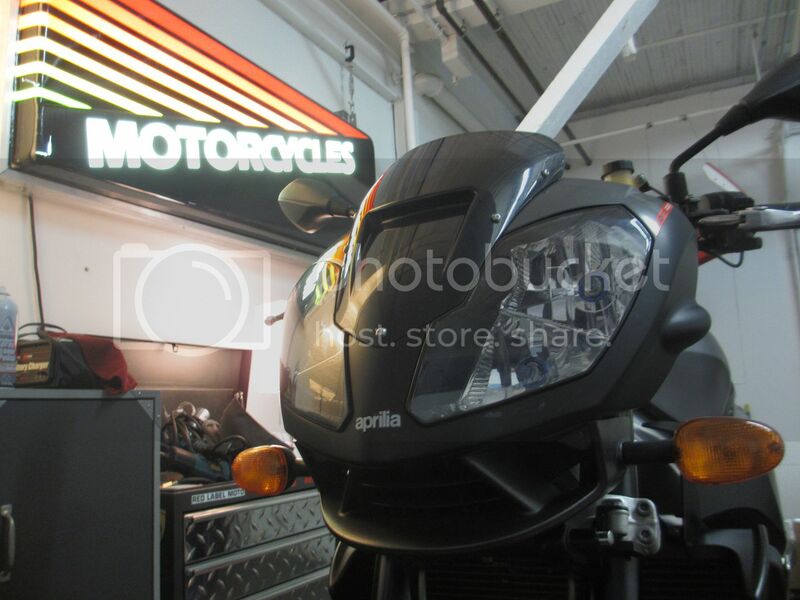 Rare Italian Honda naked street bike in excellent condition. Manufactured at the Honda facility in Italy. Many Ducati parts. Completely stock save bar end mirrors. Has never been layed down. Rides beautifully. 16,700 miles. Brand new front tire. Well serviced and always protected in garage. The 599's were built in Italy and the electronics say Ducati on them. I knew they were assembled in Italy, but had no idea Ducati actually contributed. I learned something new. The 599 was indeed made in Italy. aka CB600F or Hornet in the rest of the world. A pretty decent all-rounder. Ducati parts? Please. 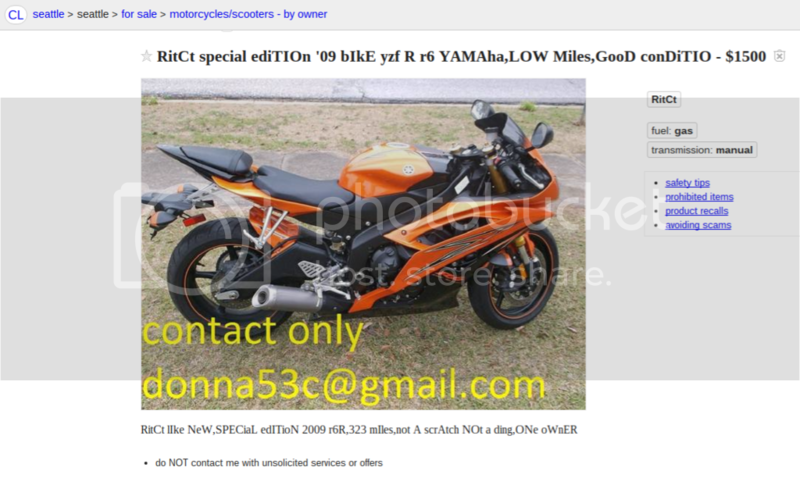 Even it had some that doesn't make the bike any better... thats a step in the wrong direction lol. I want Honda parts on a Honda. I want my Honda to be made in Japan for that matter. Bought a 599 at the University Honda liquidation auction in 2009. It was extremely "meh". Although the auctioneer rode around in a podium on wheels kinda like The Pope which was cool. The 80's neon sign I won and restored was the real prize. I don't normally shop on CList for used bikes, but I'm looking for something specific this year that is rarely in dealerships. If been looking off and on since Nov/Dec or so. Most stuff seems priced fairly well. I understand folks pricing things fairly low in the dead of winter to get rid of something quick. I'm seeing a lot of bikes for what I could consider to be like 1.5-2x more than other similar bikes. Is it common this time of year for prices to skyrocket like that? Most of these aren't anything special (IMO) - just standard 600/1000 cc Japanese supersports that you can regularly find on CList literally any day of the year. I mean no disrespect to the sellers, but I'm curious why some of them are priced much, much higher than their peers. The CBR does have a bunch of after market farkle - but most of it is pretty common stuff and most all is cosmetic. is this a phenomenon I am just now witnessing?